This beautiful lake view oasis features all the comforts of home in a small waterfront town where everyone knows their neighbors. This is a family friendly home which requires renters to be 25 years or older and the majority of your party to be in that age range (families with children excluded). It is located on the CALIFORNIA side of the lake in the private gated community of Vista Del Lago above Havasu Landing. Just a quick boat or ferry ride will take you to Lake Havasu City where the famous London Bridge in Arizona is. The property offers three (3) bedrooms, two (2) baths, *NEW* wood flooring throughout living areas, large living room with sofa bed, additional dining/game area that seats 4, a huge kitchen with an island and a dining room that seats 8. The home is smoke free, very clean, beautifully furnished with upgraded appliances, a fully equipped kitchen and can sleep up to 7 people comfortably. There are incredible lake and mountain views across the large back covered patio, with new outdoor dining set, ceiling fan, fire pit and top of the line built-in granite BBQ. The living and dining rooms boast 50” color flat screen smart TVs while each bedroom hosts a 40” color flat screen smart TV. All TVs are equipped with DIRECT TV, DVD players, are BlueTooth compatible and have FREE NetFlix. There is Free WI-FI throughout the home for those of you who need to work while you play. This property has one king bed, one queen bed, one twin over one full bunk bed with one twin trundle and a queen sleeper sofa. Guests are encouraged to bring cell phones as there is no landline to this home. We are the Thrower family from Orange County, California. We've been visiting Lake Havasu for over 20 years and it's one of our favorite places to vacation. We fell in love with this home the moment we saw it! The amazing lake views are the best thing to wake up to each morning and nothing beats falling asleep to the city lights at night. 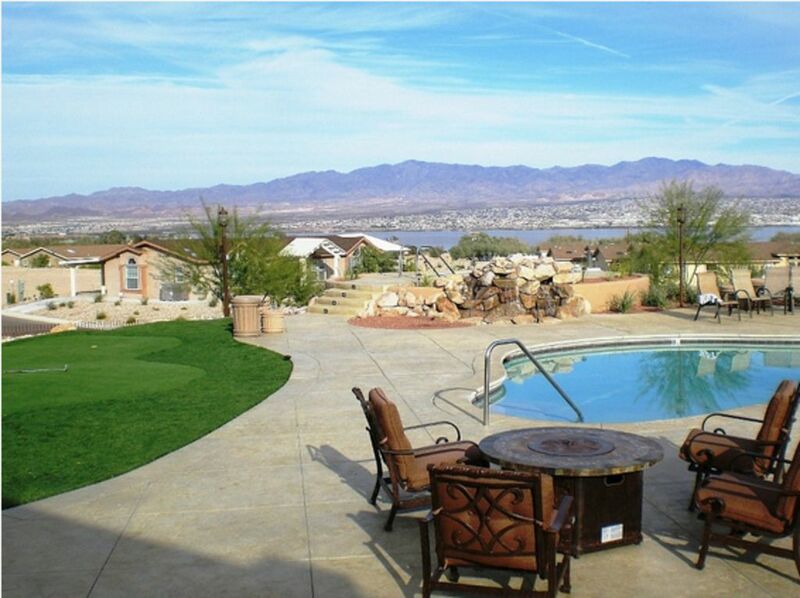 We chose to purchase a home in Havasu Landing because if offers year-round family fun. In the summer, we enjoy boating and water sports. And winter brings off-roading, target shooting and campfires. It truly is the best of both worlds! Minutes away from Havasu Landing Resort & Casino - casino, restaurant, bar, marina, fuel dock, boat slips and launch ramp. Beautiful 180 degree lake view from your back porch. Watch the sun rise over the lake each morning and let the glimmering lights from Havasu City lull you to sleep at night. Nestled in the center of the Chemehuevi Valley, this home features amazing mountain views from every window. we loved the house, town and clubhouse. It was very clean and beautiful. The only issue was the day we were leaving the club house was closed for some reason. We had really wanted to hot tub and play a game of pool with our grandkids and could not get in. Very disappointing!! The house was great to stay in but a little far away from things to do. The Thrower’s were very quick to respond and gave us all the information promptly. It was a clean place to stay and accurately described. If your desire is to do something at the lake then it’s a great place to stay but it’s a little out of the ways from other places. Overall we enjoyed our stay and thank you, Mike and Lisa. Thank you for opening your home to our family for this past weekend. We had a great time out on the lake, and really enjoyed the rest of our time at your home which had everything we could have needed. The beds were all incredibly comfortable and we were lucky enough to catch the last part of the Dodgers game on one of the many TV's at the house. Our family would love to come back again at some point. The view was great and the location is perfect with just enough empty space around the property to feel secluded within the Vista Del Lago community. Thank You! Our family loves this home. This is the second time we have stayed there. Mike and Lisa are fabulous hosts. We were unable to make our original dates due to medical issues. They understood completely and we were able to reschedule. This allowed for medical recovery and for my son to reschedule a flight in from New York. It was a Great vacation, not only because of the Havasu Lake, but to have a clean, spacious home with a view to return to every night for extra family time was wonderful. Although we only had four of us for this trip, this home is spacious enough for more people to have plenty of space for their own quite time. I could go on and on about how great of a home it is to stay in. Thank you Mike and Lisa for making it available for us to enjoy. The house was very accommodating and had all the important essentials for our stay. We enjoyed our stay very much and will be recommending this house for future trips. We simply had a great time at this house and the owners couldn't be nicer people! Aside from a refrigerator that was not functioning as well as it should have been, and the wifi glitching, everything was great. Those issues aside, Mike was always helpful and answered any questions we had, immediately. We thoroughly enjoyed our stay and would recommend this house to anyone. Thank you Mike and Lisa! Havasu Landing on the California side of the lake is a very low key friendly town. You will find folks riding around in their golf carts waving as they pass. The desert is your backyard and within seconds you can find prime locations to ride motorcycles, dune buggies or ATVs. There is even an open gun range for those who are interested in shooting. The family friendly community of Vista Del Lago offers a spectacular clubhouse with picturesque lake views! It is available to all guests and includes use of the gym, pool, Jacuzzi, putting green, 2 pool tables, ping pong table, horseshoes, free WI-FI connection and big screen satellite TV room. A quick 10 minute walk will take you to the water’s edge. Or in 0.2 miles you will find a fully equipped marina with boat launch, gas dock and boat slips available. For those of you who like to gamble, the Havasu Landing Casino offers a variety of slots and tables! The SAIL INN offers great food and drinks on a budget with a hometown bar atmosphere you won’t find in the city. The Havasu Landing Market is a fully operational grocery store with fresh meats and vegetables and a small deli. Lake Havasu City, Arizona offers exceptional nightlife. Plenty of Bars, Nightclubs, Movie Theaters, Fast Food and Fine Dining Establishments within walking distance of the London Bridge. Guest wishing to visit the Arizona side of the lake or 'Lake Havasu City' can do so by driving around which takes about an hour. Or the more favoured option is to ride the Chemehuevi Casino Jet Powered Ferry Boat called 'DREAMCATCHER'. This is a 15-20 minute ride across the lake to the marina directly below the Famous London Bridge. You don't pay going to the Arizona side but are charged $3.00 per person on the trip back. There are several Taxi companies that will take you anywhere in the city for $5.00 each way. Just in case you need to get to a Wal-Mart, Kmart, Home Depot or Local Mall for that special something. Cancellations must be made within 15 days of your arrival (30 days for long term rental or holiday weekend). Late cancellations will forfeit the rental fee.